This print from an engraving by J.A.J. 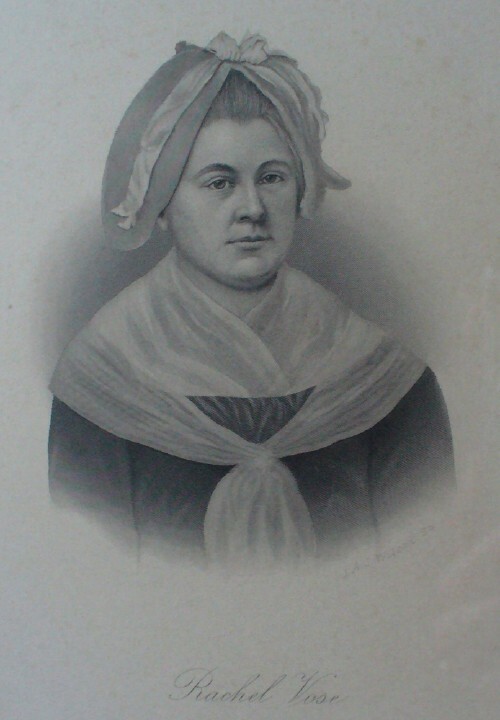 Wilcox of Boston is the only known image of Rachel Smith Vose. Born in 1737, Rachel was the daughter of Jeremiah and Rachel Smith who came from northern Ireland to Boston and then settled in Milton in 1736. Though her father was a successful businessman and friends with the likes of John Hancock and Thomas Hutchinson, Rachel didn't marry until she was 25, and then it was the 21-year old Daniel Vose. Daniel had just begun building a mercantile business with his slightly older cousin, on land purchased from Rachel's father in Milton Village. Their first baby, Patience, was born in 1763 and named for Daniel's mother. Rachel would bear three more children over the next 17 years at the house: Elizabeth, Fannie, and Daniel Thomas. Fannie died at six months, and Patience at twenty-five years, not long after giving Rachel her first grandchild, Clarissa. Rachel lived to 83, surviving Daniel by fourteen years. Shortly after Daniel Thomas was born, they moved into a larger home built on the same location as their first, and Rachel would live the rest of her life there. In her later years, she leased some of the rooms out, and her granddaughter Elizabeth Lillie cared for her until her death in 1821. We are grateful that at least one of the stories Rachel told survived her.